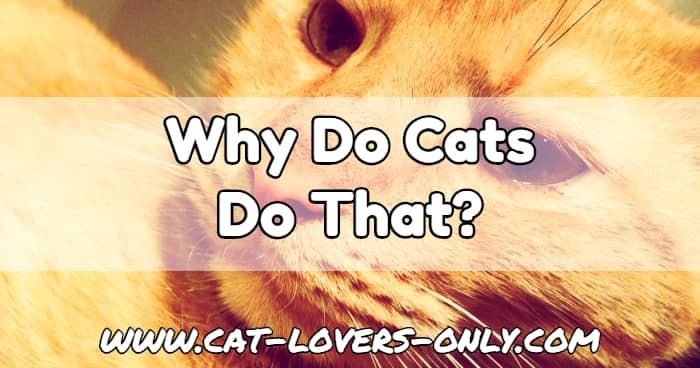 Why do cats do that? Did you ever wonder why cats blink at you, or bring you a mouse? How about why they act like they're making bread in your lap or on a couch? Do they really get stuck in trees? How come? What's the point of bringing you that mouse? We attempt to answer these and other questions here. Below is a collection of odd facts and interesting tidbits that describe the reasons for certain feline behaviors. The kneading or "milk treading" motion that cats make with their paws is a throw-back to kittenhood. Kittens knead their mother's bellies in order to stimulate the flow of milk. Later in life, adult cats tend to repeat this motion when they're very happy and relaxed. Many a cat owner has enjoyed the pleasure of a cat massage. Why do cats move their catch? Cats will sometimes move their prey from where they first caught it in an attempt to eliminate competition. For example, African leopards will bring their catch up into a tree and "store" it away from scavengers and competing predators, such as lions. Why do cats bring their prey to their people? This one is a bit of a mystery. On explanation is your cat is probably trying to involve you in the process, and perhaps teach you how to hunt (since you don't seem to be very good at it). Cats instinctively hunt, but they're taught the finer points of hunting, and how to associate hunting with eating by their mothers. This urge to hunt and teach others is strong. Your cat is just passing on the favor. Or perhaps, like Picasso's cat, Minou, she is attempting to share a meal with you. Why do cats do the "Halloween pose" and arch their backs? The familiar "Halloween cat" pose, in a multi-cat household, is usually a great way to initiate a chase. Your cat will sometimes do this to you in the hopes that you'll get better at playing cat and... well, cat, er, ah... person. The arched back and fluffed up fur make the cat look larger in order to intimidate the "enemy." Turning sideways does an even better job as the cat hops across the house. Other than that, arching the back makes for a really good stretch and helps keep felines limber. Why do cats play with their food? Probably to create the excitement of the hunt. Priscilla sometimes throws her food out of the bowl and then chases it down. She seems to like it when someone throws it for her. If you want to add some excitement to your cat's life, you can leave little treats around the house for your cat to find. Or, you can get the Deli-Dome. The Deli-Dome shoots out a ball filled with treats at set intervals. While your cat plays with the ball, it deposits treats for her to eat. It gives your cat some exercise, and relieves boredom by making eating fun. It's great for cats that are home alone while you're at work. Why do friendly cats fight with each other so much? Practice! Cats that live together by mutual agreement, and normally get along, will often play fight, in practice for the main event. Sometimes, however, they do fight for real, but they hold back and it usually doesn't last too long. Outdoor cats will fight, but more often, they'll have more of a staring contest until one backs down. Real fights can end in real damage, and cats don't have a lot of signals to show surrender. The one who gives in needs to be careful to back away slowly so as not to draw chase. Why do cats slowly blink at you? Why do cats make friends with people who don't like them? A direct stare is considered a challenge. Notice when two cats approach each other, they often do not come at each other head on. They actually will walk so that their heads pass each other a bit and then turn to the side to sniff. This indirect attention is less threatening. If they know each other well, they may go nose to nose, but this puts both cats in a vulnerable position. People who like cats may tend to stare at them, and this, ironically makes the cat uncomfortable. Those who don't like cats often don't pay much attention to them, and are therefore not seen as a threat. So, when that person sits down, the cat may decide that is the safest lap to sit in and get some indirect attention. Funny creatures! If you'd like a cat that you don't know well to come see you, try not staring directly at them. Instead, when the cat catches your gaze, blink slowly once or twice and immediately look away. Maintain a relaxed posture and don't fuss over the cat too much. You might find the cat comes and sees you when you least expect it. Cats are good climbers. It's been said that they are afraid of heights, but I'm not sure that's accurate. Their claws curve and point backwards in order to facilitate climbing. They can usually easily get to a high place in a tree. Unfortunately, those backward pointing claws don't help the cat get down, and the cat is now "stuck" up in the tree! This physiology does, however, make them good vertical climbers. Now it's your turn. 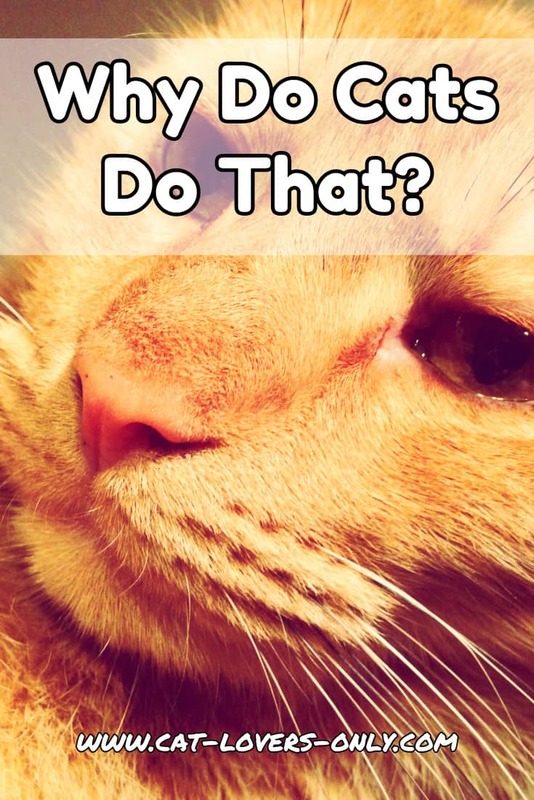 Do you have any insight as to why cats do what they do? Any observations on seemingly odd cat behavior? Let us know in the comments below! What makes cats go crazy for catnip?